America's first bikeway linked Brooklyn and Coney Island. 1895 The City of Brooklyn built the nation's first dedicated bike path three years before before it became a borough of New York City. The Coney Island Cycle Path (sometimes known as the Ocean Parkway) was 5.5 miles long and 14 feet in width. 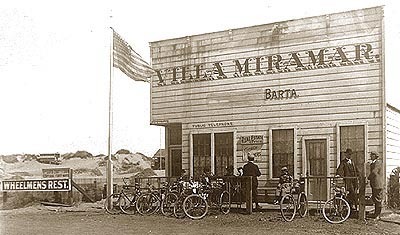 It opened on June 15, 1895 with marching bands and a parade of 10,000 cyclists, but proved to be too little of a good thing. It was widened by three feet along its entire length in December and then widened again to 34 feet in 1896. In 1897 it was completely rebuilt because it couldn't stand up to the traffic. Designed by Frederick Law Olmstead and Calvert Vaux whose "Greensward Plan" became the 843-acre Central Park, it was part of an extensive system of parkways planned to connect several neighborhoods of Brooklyn with Prospect Park. Across town, in the Bronx, the Van Cortlandt Park Golf Course became the first municipal course in the U.S. when it opened in 1895. 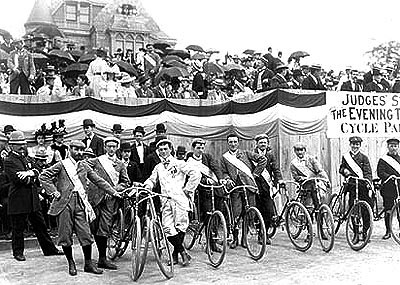 June 6, 1896 The Evening Telegram Cycle Parade attracted thousands of spectators and hundreds of cycling fanatics, many in outlandish costumes, for the race up Broadway (or the Boulevard, as it was then known) from 65th Street to 108th Street, then on to Riverside Drive and around Grant's Tomb and the Claremont Inn. New York's newspapers sponsored races and parades as they competed for circulation. Ocean Parkway terminated at Seabreeze Avenue, where hotels catered to Coney Island's seasonal visitors to the famous beaches and the major amusement parks: Steeplechase Park (1897), Luna Park (1903), and Dreamland (1904). For another perspective on the era, read When Coney Island Reigned by Nancy Eaton, first published online in Retro in August 1998. For a contemporary account, read Cycling in the City by by Jeremy Simon, first published online in the July/August 2000 issue of Eclectica. Coney Island at lower left. Ocean Parkway shown in green. 1895 The velocipede hadn't been invented when English-born Henry Pittock left Pennsylvania for the Oregon Trail in 1853. He became owner of the Weekly Oregonian in 1860 and transformed it into a major metropolitan daily that recently celebrated 150 years of northwest history. He went on to build an empire incorporating real estate, banking, railroads, steamboats, sheep ranching, silver mining and the pulp and paper industry. 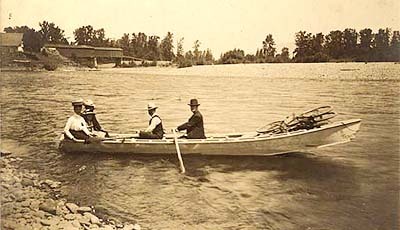 He was also an avid outdoorsman and was a founding member of the Oregon Road Club, Portland's first cycling club, in 1895. The City of Portland is consistently ranked among the best cities for cycling in the country. Forest Park is the nation's largest inner-city park with more than 50 miles of trails spread out over 4,800 acres. Mountain Bike magazine ranked the Rose City as the sixth-best bicycle town in the U.S. in June, 2001 and Bicycling Magazine rated Portland as the best cycling city in the country regardless of size in November. An ambitious Bicycle Master Plan proposes to make bicycling an integral part of daily life in the Rose City. Oregon has earned a reputation as one of the most bicycle-friendly states, developing and marking bikeways across the state since 1971. The Oregon Department of Transportation manages the Bicycle and Pedestrian Program including the popular, 370-mile Oregon Coast Bike Route. Many Oregon Parks offer Hiker-Biker campsites that may be available even when campgrounds are full. Rowing cyclists across the Willamette River in Eugene. The old Ferry Street Covered Bridge in the background was replaced in 1999 with a $30 million span and the new Peter DeFazio Bridge provides easy access to Alton Baker Park for cyclists and pedestrians. Cyclists and planners are exploring the possibilities of linking Oregon's largest cities and dozens of city, county, state and federal parks with a 200-mile Willamette River Corridor of bikeways. Eugene, Oregon's second-largest metropolitan area, is a self-proclaimed City of Bicycles! With 28 miles of off-street paths, 78 miles of on-street bicycle lanes and five bicycle-pedestrian bridges spanning the Willamette River, it was ranked ninth in the June 2001, Mountain Bike magazine report. Unfortunately, the Kryptonite Lock Company, inventors of the popular U-locks, ranked Portland #8 in its 10 Worst Cities for bicycle theft the same month. "The latest FBI Uniform Crime Report (1999) shows that the average price of the bicycles stolen is on the rise. Over 326,000 bicycles were stolen in 1999 with the average price of more than $338. That is well over $110 million lost yearly," according to the report. Corvallis has developed one of the most extensive systems of bikeways for a city its size in the country. Nearly 60 miles of marked bike lanes make pedaling safer across the city, and 13 miles of multi-use paths connect neighborhoods, parks and the city's showcase Riverfront Park. Oregon State University's McDonald-Dunn Research Forest, affectionately known to local riders as McForest, offers more than 60 miles of fire roads and singletrack trails in the sprawling 70,000-acre forest draped across the hills north of town. 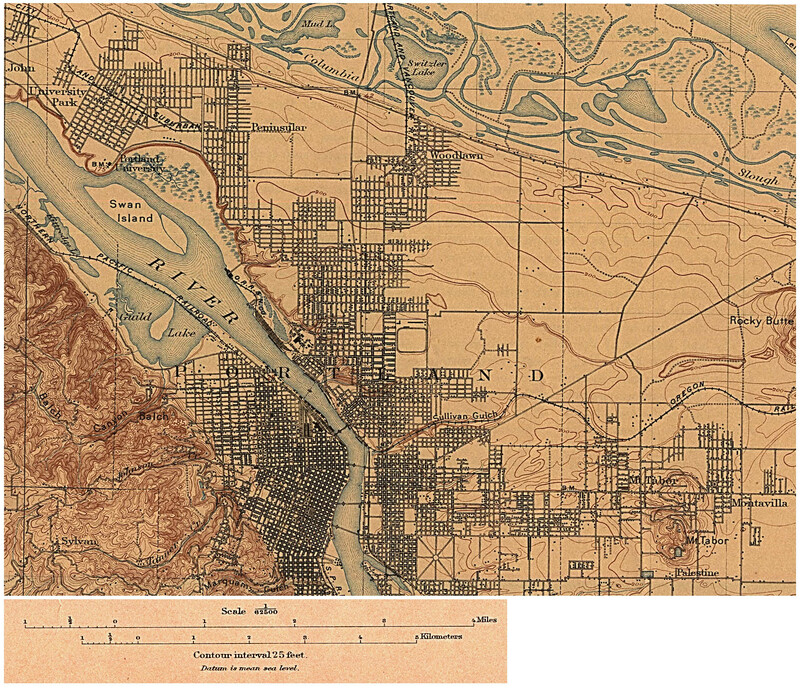 1899 When wheels were the rage, residents of the mining towns of Ashland and Medford proposed a connecting trail. Completion of the 21-mile Bear Creek Greenway is now expected in 2003. Cycling advocates in both cities got the project underway in 1973. With the help of local, state and federal grants, they began linking parks between the two cities, beginning with the Lithia Park Woodland Trail in Ashland near the Oregon-California border. The Bear Creek Greenway Foundation is coordinating the efforts with year-round bicycling, equestrian and running events. Trails and roads in the Rogue River National Forest provide spectacular views of the Mt. Shasta region. The Siskiyou Crest Mountain Bike Route begins at the Mt. Ashland Ski Area and follows the ridges for 15 miles to the summit of Dutchman Peak. 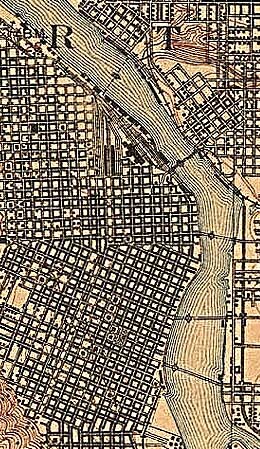 Seattle developed 20 miles of dedicated bicycle paths for the city's estimated 4,000 cyclists by 1899 when the growing city's population numbered 80,671. Today, planners estimate that about 36% of the city's 520,000 citizens engage in recreational bicycling, and between 4,000 and 8,000 people commute by bicycle in Seattle each day, depending on the time of year and weather conditions. The city's Bicycle & Pedestrian Program has developed an urban trail system to accommodate cyclists and link to 6,200 acres of parks. Urban trails include multi-use trails, bike lanes, bike routes, arterials with wide shoulders and pedestrian paths. The Emerald City has about 28 miles of bicycle trails and paths, 14 miles of on-street, striped bike lanes and about 90 miles of signed bike routes. King County, like many government agencies, provides detailed bike maps online. The Seattle Transportation Bicycle Program provides details about the Emerald City's extensive trail network. The famous Burke-Gilman Trail began as an urban railroad and has become a model of multiple-use development. Bicycling magazine named Seattle as the best city for cyclists with a population of 500,000 to one million. The city's transportation department even offers a web site devoted to Bicycle Trail Etiquette. circa 1898 San Francisco's Golden Gate Park and the Great Highway overlooking the Pacific Ocean has attracted cyclists for more than a century. 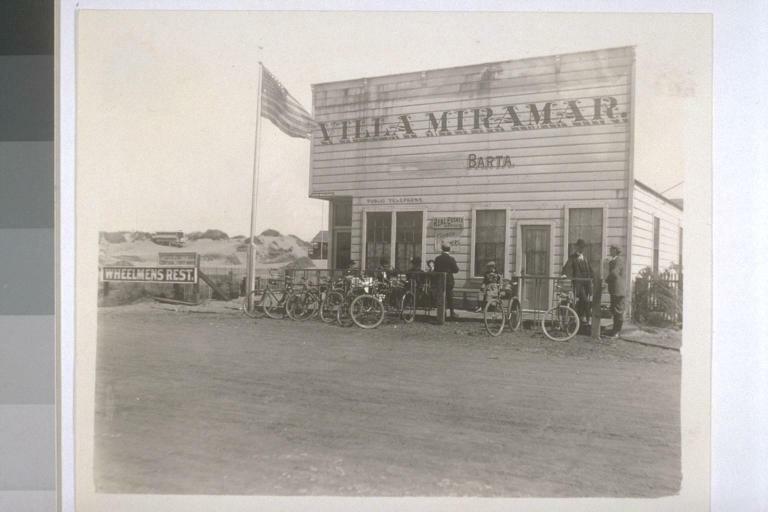 Roadhouses and taverns across the country catered to wheelmen and weekend tourists. The original Coney Island Cycle Path is at right, between the two rows of trees. 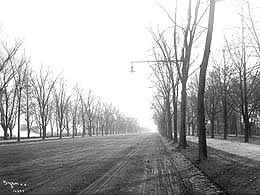 The dirt road was formally called the Ocean Parkway, but was known to New Yorkers as "The Speedway." It is now a six-lane highway. D-Ore., is a founding member of the Bipartisan Congressional Bicycle Caucus, an informal group whose primary goal is to provide a place for cycling Members of Congress and their staffs to have fun. The group also provides Congressional leadership to complement the efforts of cyclists working for safer roads, more bikeways, convenient bike parking and increased recognition of the importance of cycling. Now numbering 81 Members, the Bike Caucus believes: "It is in the national interest to promote low-cost, low-impact transportation modes which decrease our reliance on imported fossil fuels; It is in the national interest to insure that our national infrastructure provides safe, appropriate transportation options for all citizens; and Cycling as a mode of transportation requires no fossil fuels, has no impact on air quality, creates less wear and tear on roads, and is more affordable than automated vehicles. 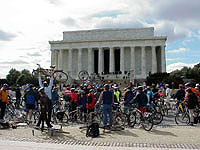 The Bike Caucus has been formed to promote cycling as an inexpensive, non-polluting, healthy and fun mode of transportation for all kinds of trips through: Briefings for Members of the House of Representatives and their staff; Educational and recreational rides for Members of the House of Representatives and their staff; and Legislation." The Portland Congressman introduced the Bike Commuter Act on March 28, 2001, legislation that would allow employees who bike to work the same financial incentives as car-poolers and mass transit users. Co-sponsored by Rep. Mark Foley (R-Fla.) and 24 others, the bill would change the Transportation Fringe Benefit of the tax code to include bicyclists who choose to bike to work. H.R. 1265 has been referred to the House Committee on Ways and Means.